Four wines: A, B, C & D. Four tasters: Josh, Liz, Amy & Pete. Notes are a combination of mine and those of the other tasters. Makers: Revealed at the end. Places of origin (in no particular order): Lake Michigan Shore AVA, Old Mission Peninsula AVA, Willamette Valley AVA, Oregon, Russian River Valley AVA, California. A: Cherry jam, plum, cedar. B: Wild blackberry, hint of brett (fades quickly), wet earth, black pepper, cedar. C: Mild compared to the others. Crushed strawberry, a little oak. D: Crushed mulberry, oak, coffee, pepper. A: Cherry juice, black pepper, smoke, almost no acid. B: Light mouthfeel. Broken grape stem, tangy. Raspberry, toasted oak. C: Light bodied. Strawberry, red currant, lightly acidic. D: Black current jam, blackberry, lemon, earth. A: A little oak, black cherry. B: Chewy. One taster noted an unpleasant aftertaste. C: Toasted French oak, a little fruit. D: Light. Fruity with a little oak and leather. A: De Loach PN, Russian River Valley AVA, Sonoma County, California. B: Domaine Berrien PN, Martha’s & Katherine’s Vineyards, DB estate, Lake Michigan Shore AVA, Michigan. C: Chateau Chantal PN, Old Mission Peninsula AVA, Traverse City, Michigan. D: Kirkland Signature PN, Willamette Valley AVA, Oregon. Parting words: I got idea for this head to head after I noticed that I had purchased a lot of 2016 Pinot Noir in the past couple months. I thought comparing an LMS Pinot to an OMP Pinot and comparing both of them to ones from Oregon and Sonoma might be a fun and educational excercise. They had to be around the same price, too, to keep us from tasting the price differences rather than the terroir and technique of the wine makers. I know this is a Michigan wine blog, but I will say that my personal favorite was the Kirkland. It was the most balanced and was a delight to drink from beginning to end. My least was the De Loach. It tasted overripe and was nothing but sweet fruit. Of the two Michigan wines, the Chateau Chantal Pinot was the most balanced and drinkable, but it was very mild compared to the others. I’ve complained about this before. Domaine Berrien was good, but tasted a little green and unrefined compared to the others. I know from experience, though, the Wally’s wines can take a while to blossom, even in a warm vintage like 2016. Another year or two in the bottle is recommended for DB PN. The other tasters varied in their choices, but the differences were all a matter of taste not of disagreement of quality or flaws. One taster liked the fruity sweetness of De Loach, but disliked Domaine Barrien strongly. Another found Chateau Chantal delightful, but Kirkland overbearing. These are all good value wines. Kirkland and Chateau Chantal are recommended. Domaine Berrien is recommended with further cellaring and De Loach is mildly recommended. Purchased for $30 (Michigan by the Bottle Tasting Room, Auburn Hills). Palate: Buttered toast with marmalade and a slice of melon on the side. Finish: Sage, lemon zest. Fruit fades, but butter lingers. Parting words: Last week I reviewed Chateau Chantal’s 30 Year Vineyard Anniversary Reserve Riesling, so this week it’s the Chard’s turn. I usually like to review wines that have spent more time in the bottle than these, but since they’re special releases that will likely sell out quickly, I thought I should go ahead and review both. It helps that they’re both very good! The Riesling, while good now, is a year or more away from its peak as I said in my review last week. This Chardonnay is firing on all cylinders right now. I’m sure it would hold up fine with another year or two in a cellar, but why wait? It’s already delicious. For me to enjoy an oaked Chard, there have to be other things going on besides oak and butter. Oak and malo flavors are in the foreground here without question, but there is enough fruit and acid to round things out. More than that, this is one of the best examples of this style in Michigan. Like the Riesling, the only place to get this wine is at the Chateau or at the Auburn Hills location of Michigan by the Bottle. Unlike the Riesling, the 30 year Chard is on the menu, so I would guess that more of it was produced, but why wait? Go out and buy some now. Chateau Chantal 30 Year Anniversary Reserve Chardonnay is highly recommended. Thanks to Cortney for tracking down additional information for me! Palate: Medium-bodied and quite dry. Fresh picked pears, medium-tart apple, sage, gravel dust. Finish: Long and drying. Lemon thyme. Parting words: Chateau Chantal is one of the oldest estates on the Old Mission Peninsula and in Northern Michigan wine country. Founded in 1983 by Nadine and Robert Begin (a former nun and former priest respectively) as Begin Orchards, it was incorporated as a winery in 1991 and named after their daughter Marie-Chantal (now the winery CEO). The vineyard this wine and its sister wine the 30 Year Vineyard Anniversary Reserve Chardonnay, come from a vineyard on the estate planted in 1986. Luckily for the Chateau, the 2016 vintage was a stellar one, so the anniversary can be celebrated properly with two (or more?) wonderful wines. Thirty-year-old vines are pretty old for Michigan, due to the climate and youth of the wine industry in the state. This wine shows the characteristics one would hope for in an old vine selection. It has complexity, depth and a surprising intensity. It tastes great now, especially with food, but with another year or two in the cellar the flavors should intergrate a little better to make a truly great wine. So drink now or cellar? Yes. Head up to Chateau Chantal or to the Michigan by the Bottle Tasting Room in Auburn Hills (the only two places to find this wine) and grab yourself two or more bottles. Hurry though, this wine was produced in very limited quantities! Chateau Chantal 30 Year Vineyard Anniversary Reserve Riesling is recommended. Look for a review of the Chardonnay in the near future. Note: Notes taken after having been open 24 hrs. Nose: Light and vaguely fruity. Blackberry jam, cedar, grape juice. On the palate: Light and easy drinking. Fresh strawberries, a taste of wood, not much else. Finish: More cedar and a bit of black pepper, but still lightly fruity. Parting words: Pinot Noir is an up and coming grape for Northern Michigan. It has been grown there for some time, but there have been raised expectations as of late. There’s no reason why good Pinot couldn’t be produced in Michigan. Pinot Noir is widely grown in the same regions in Europe where Riesling, Pinot Gris and Gewurztraminer are grown and all those do well in the Great Lakes State. This is a wine without any obvious flaws (aside being a little lively upon first pour) but I was disappointed with how timid it was. It reminds me of inexpensive négociant-produced red Burgundy I’ve had. In the wine’s defense, the back label makes it pretty clear what to expect: an easy-going, food friendly wine. I would stay away from beef, lamb or ham, but pork, turkey or salmon would pair very nicely with this wine as would a cheese course or dark chocolate. There is no shortage of decent red Michigan blends available for purchase just about anywhere in this state. Some of the best of those are from Chateau Chantal. When I buy a vintage varietal for a vintage varietal price, I expect more character than I got in this bottle. 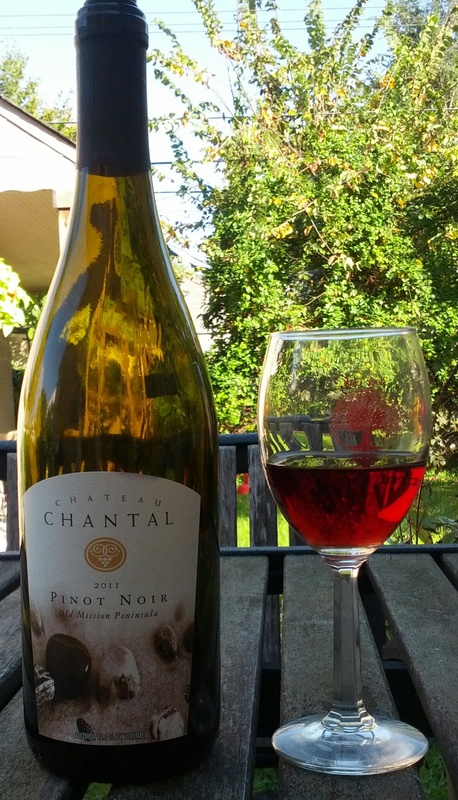 For that reason, Chateau Chantal Pinot Noir 2011 is only mildly recommended.